Over 90% of households in the Philippines don’t realize that there are still germs in their toilet that may lead to diseases like diarrhea – the 4th leading cause of deathes among children under 5 years old. 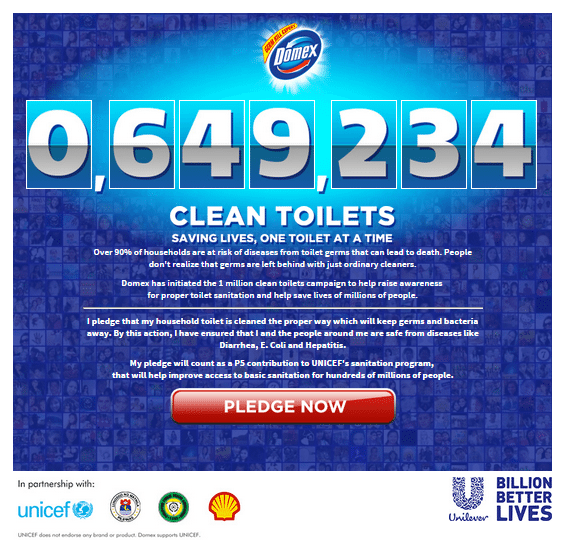 Unilever through its brand Domex has initiated the One Million Clean Toilets Movement. This campaign aims to educate and help Filipinos develop the habit on proper toilet hygiene and sanitation to reduce the incidence of diseases caused by germs. In partnership with UNICEF, Pilipinas Shell, Philippine Public Health Association (PPHA), and the Locan Government of the City of Manila, Domex will strengthen the Filipino’s Capacities in the proper cleaning methods to ensure germ-free toilets.